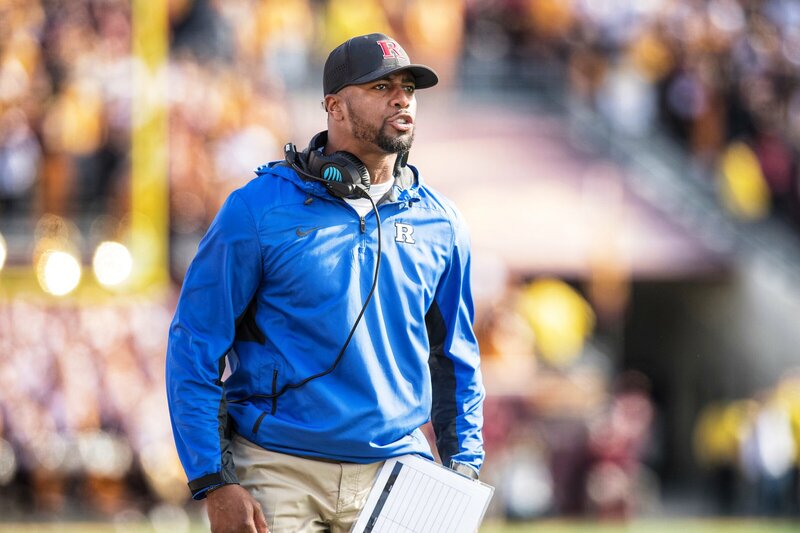 Virginia Tech has announced the hiring of Jafar Williams as the program’s new wide receivers coach. He was most recently the running backs coach at the University of Maryland, his alma mater, where he played wide receiver. Williams has been a full-time coach or a graduate assistant at eight different schools, and he has coached with a current member of the Virginia Tech coaching staff. Williams coached at Illinois State in 2007 and 2008, where he was a member of the same coaching staff as current Tech offensive coordinator Brad Cornelsen in 2007. He’ll replace wide receivers coach Holmon Wiggins, who left Blacksburg to take the same position at Alabama. Wiggins did an excellent job developing players such as Eric Kumah, Damon Hazelton and Tre Turner during his Tech career. He also coached Isaiah Ford for one season, and Cam Phillips for two. Williams began his coaching career as passing game coordinator/wide receivers coach at Moravian College in Bethlehem, Penn., from 2005-06, helping that school win its first conference title. He then enjoyed a two-year stint as wide receivers coach at Illinois State (2007-08), where WR Eyad Salem earned first-team All-Missouri Valley Conference honors and WR Jason Horton received second-team All-MVC accolades under his tutelage. In 2009, he moved on to coach wide receivers at Howard University, where WR Willie Carter earned second-team All-Mid-Eastern Athletic Conference acclaim. After a one-year stint as special teams quality control coach for Pat Fitzgerald at Northwestern (2010), he spent two seasons as running backs coach at Kent State (2011-12). The Golden Flashes went 11-3 in 2012 and earned the MAC’s East Division title with an 8-0 conference record. At Kent State, he coached one of the nation’s most productive rushing duos in RBs Dri Archer and Traylon Durham, who combined to rush for 2,745 yards and 30 touchdowns in 2012. Archer led Kent State with 1,429 rushing yards and also hauled in a team-high 39 receptions for 561 yards with four touchdowns, while returning 16 kickoffs for 591 yards with three TDs to earn consensus All-America honors following the 2012 season. Meanwhile, Durham finished with 1,316 rushing yards and 14 touchdowns, as the team ranked 18th nationally in rushing offense (225.8 ypg). Archer was selected by Pittsburgh in the third round of the 2014 NFL Draft. Williams coached running backs at Purdue (2013-15), helping RB Markell Jones set the school’s freshman rushing record with 875 yards in 2015. His 72.9 yards-per-game rushing average ranked eighth in the Big Ten, while his 10 rushing TDs led the Boilermakers. In 2014, RB Akeem Hunt led Purdue with 949 rushing yards and ranked eighth in the Big Ten by averaging 79.1 rushing ypg. Prior to returning to his alma mater in 2018, Williams coached wide receivers at Rutgers in 2016-17. In 2016, WR Jawuan Harris led all Big Ten freshmen with 39 catches for 481 yards. Williams once again mentored a prolific rushing duo in 2018 as RBs Anthony McFarland (7.9 yards per carry) and Ty Johnson (7.7 yards per carry) ranked second and third respectively in the Big Ten in rushing average. McFarland led the squad in rushing with 131 carries for 1,034 yards (7.9 avg.) and four TDs, with his 86.2 yards-per-game average ranking eighth in the conference. In 44 career collegiate games as a player, he caught 90 passes for 1,301 yards (14.5 avg.) with seven TDs, including a 64-yard score in the 2002 Orange Bowl. He averaged 20.07 yards per catch for the Terrapins in 2002, the third-best seasonal mark in school history. He holds a degree in health and human performance. More than likely the people who complained about Beamer are the same complainers whining about Fuente. They are what they are & they want instant gratification. The truth is the success of the recruiter (asst. coach) is based upon the reputation and skill of the head coach. If you are recruiting for CFB in his prime you have good success recruiting; if you recruit for a Rutgers h.c. than you don’t. Jafar’s success will depend on CJF’s reputation and skill. Welcome Coach Williams to Hokie Nation! No doubt he’ll be another Mitchell and Nix type, fabulous recruiter and coach. Turned down many top 20 programs to come here. Welcome to Virgnia Tech, Coach Williams. Glad to have you on board. Go Hokies!! One of Those “Wait & See ” Hires. Hard to say , IMHO, anything about the hire. Looks like a good fit, good coach and has ties to recruiting areas that Tech has not yet reached out so to me it’s a plus. The on-field product must be much better than the `18 edition or CJF will be in serious trouble and the moving vans will be headed his way. You know what the problem is at tech ? It is simple that people can’t join the new world and want to live in the past, get over Beamer, he did a great job but that time is over….. give Fu a fair chance, he had to clean up 2013,14 and 15. Well said. Coach Beamer will always be the man who put the Hokies on the national map, but the calls to fire Fuente at this point are knee jerk reactions from clueless individuals. Why is one person’s opinion gospel and another’s clueless? Westend, I was over Beamer a full two years before he left. You don’t think CJF needs to put a “better on-field product” in 19 than an 18 team that lost to Ga Tech [who fired their coach], lost to Miami by 28 points [who was embarrassed in their bowl and will soon fire their coach], wasn’t competitive with Pitt, lost to Boston College, lost to ODU, lost to Cincy, barely beat UNC [who fired their coach]? Basically we beat Virginia and Duke, and a Florida State team that was the worst FSU team in the last 30 years. Three years of season ticket holders have long been over Beamer, IMHO. But who wants to pay a seat license and $50/game to watch a team that is not even competitive with Pitt? Not me. We won’t need the debate – If we play and perform like 18, even the loyal Hokie fans will not show up in numbers. Here’s hoping for a better product. The Early Beamer years are long ago and no school will tolerate that same path these days. Right or wrong this is the new reality and these people that “pontificate” are living in the present. C’mon, bro! You gotta give a new FB coach 5 years min, unless some egregious misconduct issue happens. The 2019 season will only be year 4 for CJF. I will be looking for team unity this fall, along with an improvement in defensive fundamentals. If coach is happy, then I’m happy. Happy Happy Happy, I’m so unbelievably happy. I presume he’s been happy all season, I know I have been. Nothing like home games over in the third quarter, makes for great exit traffic, happy. Can he RECRUIT?!? If he can, it’s a plus. We need RECRUITERS!!! Sounds more like a good RB coach to me. But, this is the path for a younger coach. All those stops are the paying dues and finding bits. VT is a big job for him and the connection with Corn probably means good chemistry for the O side. Meh. Prob has an eye for that G5 talent Fuente desires. Gotta admit I am nervous. Our program just isn’t used to assistants leaving. It also looks like Wiggins had more upside….I mean….he must have if he scored the Alabama gig. Last 2 jobs he left Rutgers to coach at his alma mater and then that whole ducking thing happened. Can’t hold either against him. Yeah, you gotta be carefule about assistants, they get cleaned out when the head guy gets canned. One paradox is that Canada was doing reasonably well under the circumstances after Durkin left. Not much of a tell, but something. At least he looks like a dude. I really have no idea if this is a good hire or not. So, in Fuente I trust.